World 5-5 is the fifth level of World 5 in Super Mario 3D Land. It is a sky level, with various grass-covered platforms, with some clouds. Propeller Boxes are the primary item of the course and are scattered around to reach platforms. Some wind turbines are seen on the bottom of the level. Mario starts on a floating grass-covered platform with a Big Tail Goomba and two ? Blocks. The right ? Blocks can be turned into a Propeller Box, which is required to complete the level. 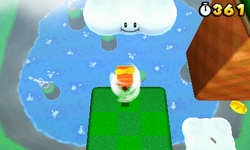 Mario uses the Propeller Box to climb the clouds and smaller grass-covered platforms. On the second of the smaller grass-covered platforms there are five Biddybuds walking in a circle. Directly to right of the platform there is another one with two ? Blocks. The left one contains a Propeller Box, should the player have lost theirs by coming into contact with a Biddybud. The next platform Mario reaches hosts a Goomba Tower made of nine Goombas. Another Propeller Box is on the platform to the left within the middle ? Box. Next there are two cloud platforms, the player must ride one to the bouncy, orange platform which will let Mario hop up to the next platform, where he will see another Big Tail Goomba. The platform to the left will provide Mario with a Propeller Box. This is the location of Star Medal 1. Mario with the Propeller Box equipped must jump to two rail clouds, until he reaches the next two grass-covered platforms. Here, the player will find the Checkpoint Flag and a pair of Binoculars (used to see Toad wearing a Propeller Box who demonstrates the Propeller Box's capabilities to Mario by spinning down from an extreme height to the Goal Pole). Ahead, two more ? Blocks can be hit, the left one containing a Propeller Box. Mario, then, needs to propel towards the three bouncy, orange platforms which must be passed in order to get to the next section of grass-covered platforms. Between the end two bouncy platforms is the location of Star Medal 2. On this section of grass-covered platforms there are two Big Tail Goombas. One of the Big Tail Goombas will drop a Super Leaf instead of three coins. In the ? Block immediately beside Mario there is a Propeller Box. In the Flying ? Block, there is a 1-Up Mushroom. This can only be reached using a Propeller Box. The brick at the the left hand side, when broken reveals a Tail Wheel which Mario can spin when he swings the tail of the Tanooki Suit. This raises the platform up to the same level as another platform with a green + Clock and a P Switch which causes five Coin Rings to appear which leads the player down to a small, bouncy platform. If the player does not take that path instead going straight ahead from the Big Tail Goombas, they will end up on the same bouncy, orange platform. From the bouncy, orange platform, the player must head for the platform with the P Switch on it. Pressing it will make sixteen music notes appear. After collecting them, Mario must head for the last bouncy, orange platform. Star Medal 3 is located just before it. After this point there is very little land left to land on. Just before the Goal Pole are six Para-Biddybuds that can be near the Goal Pole. Star Medal 1: After going through a part of the level, the player will come across the second Big Tail Goomba. Between the two grass-covered platforms, the Star Medal can be found. The player can obtain it by wall jumping or using a Propeller Box. Star Medal 2: After the checkpoint, there will be three bouncy platforms. Between the last two platforms floats the second medal. Good timing and a Propeller Box are required. Star Medal 3: The third medal can be found on the way down to the Goal Pole before the second orange, bouncy platform. It can be reached using said platform and a Propeller Box.